Thank you. I'm happy the post was useful to you. Link to it if you can so others can find it easier. The test active syn URL works perfectly. That URL is useful for a quick kind of self tests. Since this port, there's been an active sync and auto-discover test URL created by Microsoft (maybe not directly created). The online test works great but this URL that is specific the server and customer I am support at the time is great for one main reason. The reason is it's a faster test than Microsoft and it can be run as a quick online self-test for active sync. Exchange 201 and 2013 active sync is very much the same at active sync found in MS Exchange 2007. Exchange 1010 and 2013 however have many more command line options available through MS Exchange power shell. These types of problems can be handles remotely with web based online remote desktop control software. 4RemoteSupport software for online desktop support is made up of desktop remote control software. 4RemoteSupport online desktop support software allows remote control of the desktop or server through the web. Once connected the tech-support agent can access the local file system of the remote system and also of course the services on the system. 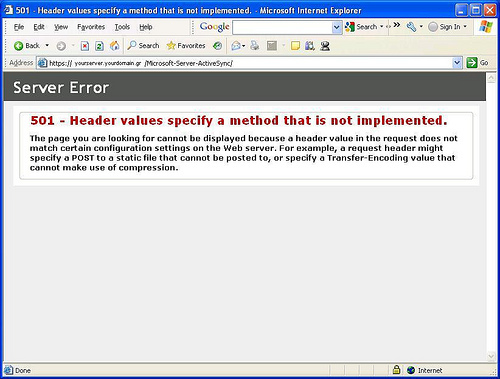 In the case of a server running IIS for active sync or even the Microsoft Exchange server itself. This is still the message displayed when connecting to active sync with a browser. To many who are configuring their own smartphones , this message may seem like a real error that would inherently prevent proper communication between a smartphone and Microsoft active sync. I recently had to work on an issue regarding smart phones using active sync but never showing email. The account would set up successfully every time however , mail or email folders would never be displayed. Addtitionaly, as part of this odd phenomena and active sync anomaly, there would be no error. Standard attempts to troubleshoot and correct the problem were applied. This problem occurred on I phones,android devices, and even blackberry 10 smart phones with active sync capabilities. The common agenda with all these smartphone devices was the account with consistency and no error, would setup on the device. One of the actions for trouble shooting this issue as part of the technical support we provide to this client was to test and validate successfull and correct functionality of Microsoft Active sync on their in-house Microsoft Exchange server. Coincidentily, my company installed it and we provide support and maintenance for their MS exchange deployment. All work was done remotely for troubleshooting the active sync issue. I was remotely connected to the Exchange server and full desktop access of the server and system. What would have been very helpful would have been remote control of the smart phones. The issue turned out to be the permissions on the users active directory accounts. My company uses online desktop support software to address these issues. Since we are a managed services and hosting company, our clients are located all over the country. Additionally, we have client that are international corporations and have officesor production plants around the world. We are unable to be physically at all computer and devices that need technical support. We use software for remote access. We use remote access software not just for remote desktop viewing of the computer dedesktop PC or server but also for remote control screen sharing. We host Exchange for hundreds of clients. Some clients are small and others are large. We have seen and experienced troubleshooting many type of desktop email issues and of course recently many issues related to active sync and smart phones.